Fri., Oct. 6, 2017, 7:28 p.m.
Overview: The 22-ranked Whitworth Pirates are looking for their first Northwest Conference win after falling to powerhouse Linfield 38-9 last week in the NWC opener for both teams. It was Whitworth’s first loss of the season after outscoring its first three opponents 158-23. George Fox is off to its best start since the football team was reinstated in 2014. The Bruins, who have started receiving votes in the D3football.com poll, opened conference play last weekend with a 27-7 win over Pacific (Oregon). The win extended the Bruins’ winning streak to three games, a turnaround from last year’s 0-3 start. 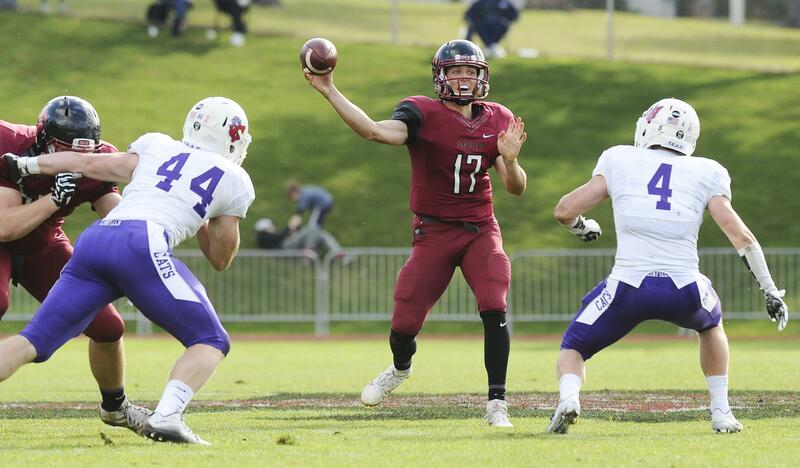 Whitworth, led by fifth-year senior quarterback Ian Kolste, will face a daunting George Fox defense and leading lineman Charles Riga. Riga, who is 19th in Division III tackles (47) and 35th in solo tackles (25), had a team-high 12 tackles and half a sack against Pacific. He leads a defensive line that has allowed its opponents only 11.8 points per game this season, the best in the NWC. The Pirates have converted 52 percent of their third-down opportunities. The Bruins’ defense has held teams to 38 percent of their third-down conversion attempts this year. The Pirates lead the all-time series 3-0. Whitworth won the last meeting 28-23 when the Pirates spoiled George Fox’s homecoming weekend in Newberg, Oregon, last season. Published: Oct. 6, 2017, 7:28 p.m.